Income Tax 2018/19 is a practical overview of income tax in the UK from one of the UK’s leading tax writers. It covers the day-to-day issues most frequently encountered by tax practitioners, explaining in straightforward terms what the law means in practice. Worked examples are used throughout to aid understanding. 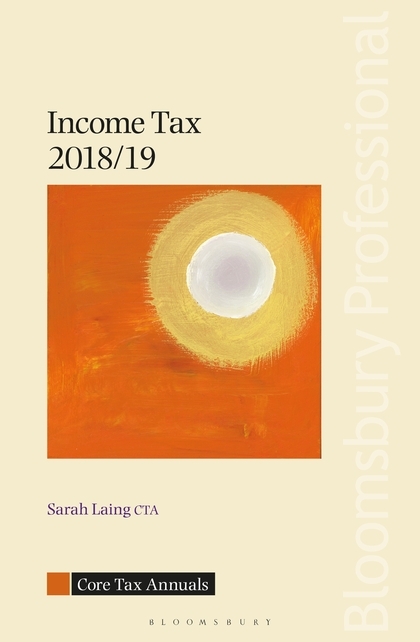 Bloomsbury Professional Core Tax Annuals include ‘signposts’ at the beginning of each chapter containing a summary of the main points and cross-references to relevant sections of the chapter. These, along with the ‘focus’ sections highlighting the key points in each chapter and examples which are presented in shaded panels for easier reference, makes Income Tax 2018/19 a convenient and accessible resource.